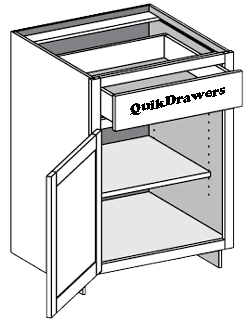 Type in the clear, unobstructed opening of your cabinet to the nearest 1/16", minus 1/4". Your trays and hardware will be dimensioned to fit. Watch out for hinges or doors that don't open out of the way. If you are not shelf mounting these pullout/rollout shelves, choose one of the other mounting methods below. 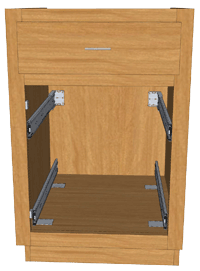 If you are mounting your shelves direct to the cabinet frame, you will want to order your shelves to fit the entire clear opening (see step 4). 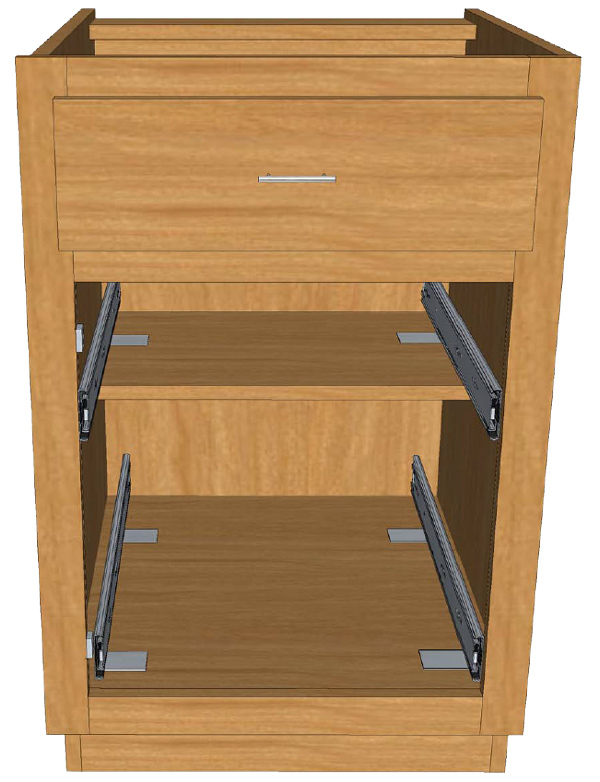 4 "L" brackets - Normally for a full depth shelf or base shelf where the new pullout/rollout will sit completely on the existing shelf or cabinet base. Subract 1/4" from clear opening. Both upper and lower pullout/rollout will use the 4 "L" bracket method for installation. 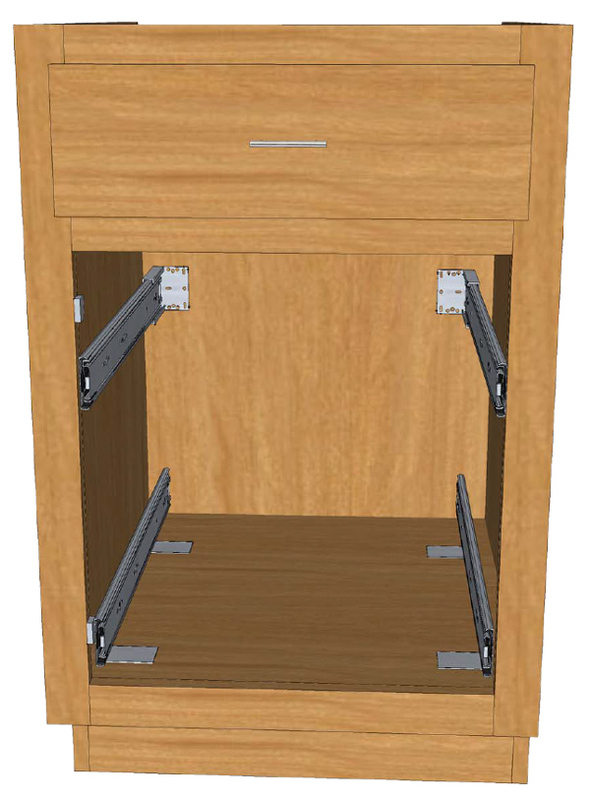 2 "L" brackets - Normally for a half depth shelf, the rear of the new pullout/rollout uses 2 "L" brackets and will sit on the shelf in the rear and the front of the shelf is attached to the cabinet face/frame. Do NOT subtract the 1/4". The bottom or base pullout/rollout will use the 4 "L" bracket method for installation. We strongly recommend that you add the Pullout Bumpers which are offered in the pulldown menus above. These will help to protect the interior of your cabinet doors from being marred by the pullout shelves as they are pulled out or if the doors are not fully opened or closed prematurely. The pullout shelf bumper is attached only on the hinge side of the pullout shelf front. 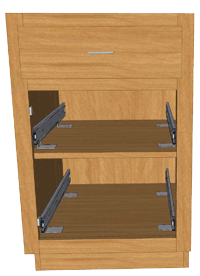 If your cabinet openings are hinged on only one side, then you will need only 1 bumper per shelf. 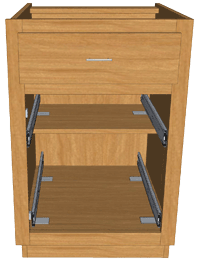 If your cabinet opening is hinged on both sides, then you will need two bumpers per pullout shelf. See pullout bumpers here. If using the 4 "L" brackets, just measure your clear, unobstructed opening, and then subtract 1/4", this will be your width (Example: 15" opening, order a 14 3/4" wide set). Watch out for hinges or doors that don't open out of the way. Your assembled unit will be calculated to fit into the dimension of the opening that your order specifies. Use a 22" depth in most kitchens and 18" depth in most common bathroom or vanity cabinets. Picture above shows the finished width of this actual pullout/rollout shelf is 15"
Picture shows the 15" pullout/rollout shelf with the full extension slides attached and is now 16-1/16" wide. This will be fine for 2 "L" bracket or 2 rear bracket method of installation. 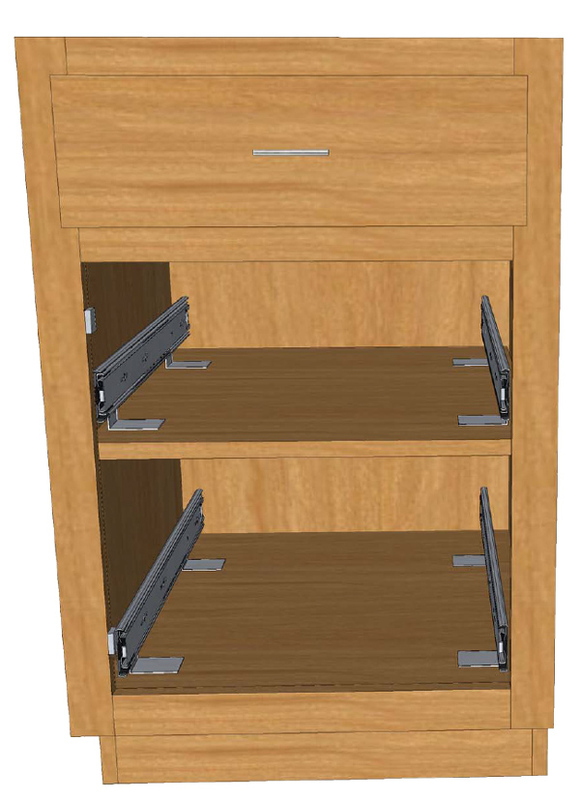 These pullout shelves may be mounted to a shelf or base deck of your cabinet or the pullout shelves can be mounted directly to the cabinet face frame and/or the side or rear wall (request rear mounting bracket instead of base bracket if needed). 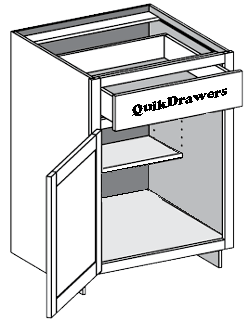 Full extension drawer slide installation instructions. 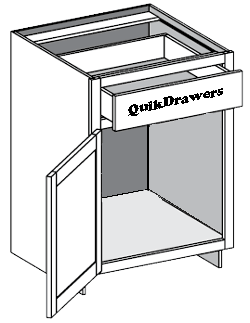 Be sure to see our QuikDrawers "All in One Kit' if you want adjustable pullout shelving. Production lead time for the 5 pack is 7-8 work days. Pullout shelf widths above 23" are constructed with 1/2" thick bottom, included in the up-charge.